Energy efficiency, reliability, and performance are all motivating factors when purchasing a walk-in cooler or freezer. With today’s financial uncertainty and rising prices, food and beverage vendors are looking for ways to save money through energy and product conservation. 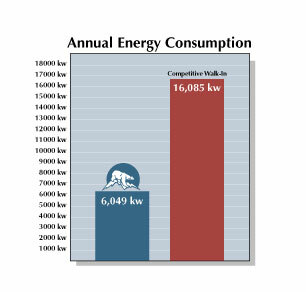 Many have found that reducing their energy consumption can be achieved by utilizing today’s more efficient kitchen equipment and refrigeration systems, Polar King lowers walk in freezer energy consumption up to 62% in some areas. Depending on factors such as weather and location, in some cases walk-in coolers and freezers can account for as much as 40% of a restaurants total energy usage. Outdated and underperforming units can dramatically affect energy prices and consumption. Over time, traditional metal panel walk-in units can suffer from moisture retention, lowering the R-value of the insulation thereby reducing the overall effectiveness and efficiency of the unit. This will not only increase overall energy consumption, but could also affect product quality. The annual operating costs of traditional metal panel units can be as much as 62% higher than that of a Polar King. 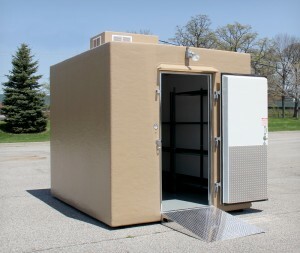 With seamless fiberglass construction, our units prevent moisture penetration, retaining the R-Value of the insulation. This will not only extend the life of your walk-in cooler or freezer but also provide a long-term return on your investment. *Energy test was conducted on two units, each measuring 8’x14’ and 10+ years old. Watt-hour meters were installed and monitored over a three week period on units that were in identical climates and in similar locations.